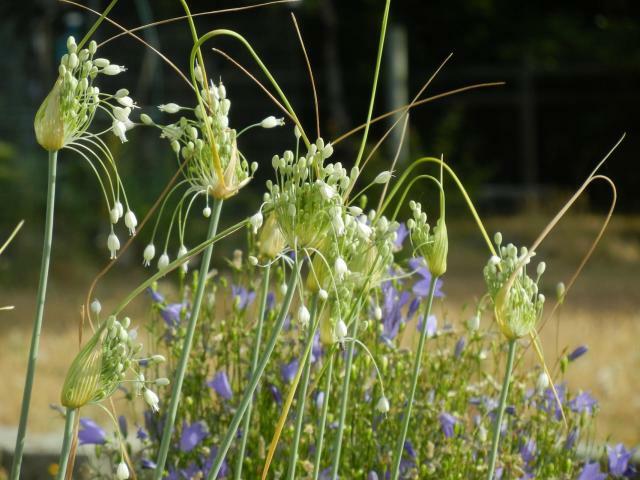 Allium carinatum L. is from much of Europe into Asia, naturalized elsewhere (the Brittish Isles). Informal sprays of little rose-purple, rose-pink, to white flowers dangling on very long slender pedicels, sometimes with bulbils (though many selections are bulbil-free). 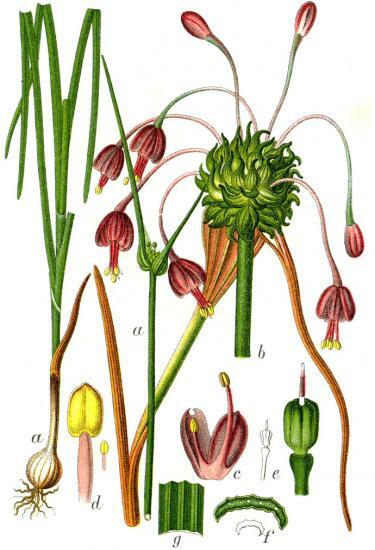 Illustration below showing many green bulbils from "Deutschlands Flora in Abbildungen (nur Tafeln)" (1796) Stuttgart Anzahl gescannter Seiten: 883. 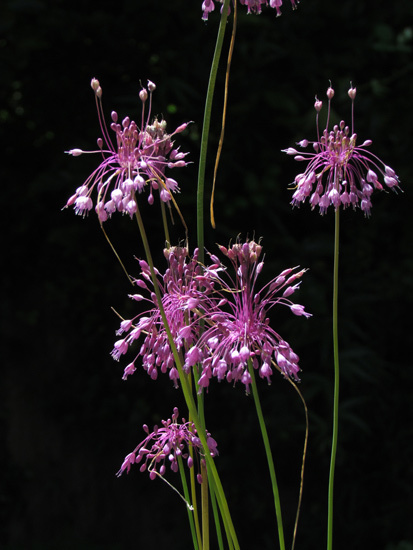 Allium carinatum ssp. 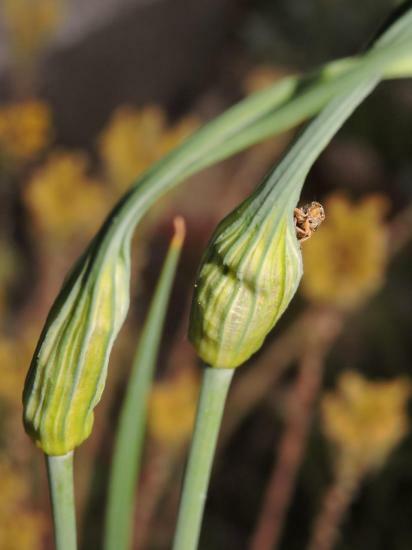 pulchellum - a European species that is very close to A. flavum, flowering at the same time in June or July depending on the variety grown. 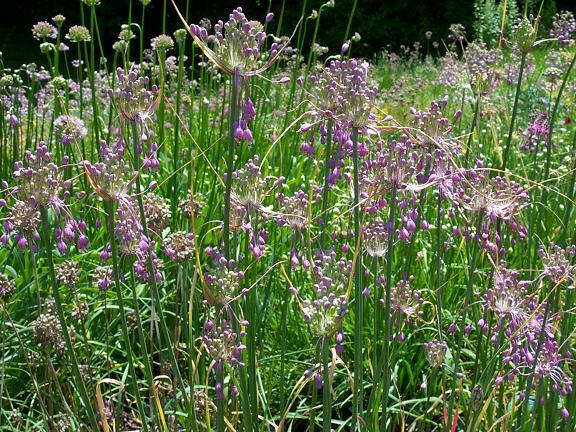 The second photo is of a a dwarf bluish-purple form and a creamy white form, collected on Mt. Olympus, Greece. 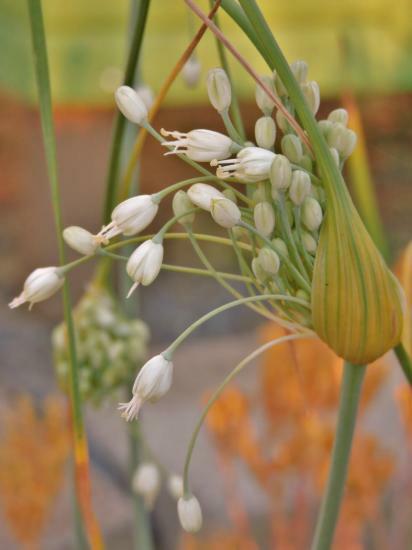 This is the plant that was offered by Hoog & Dix as a blue-flowered form of Allium flavum ssp. tauricum, but it is undoubtedly a "pulchellum" variant. 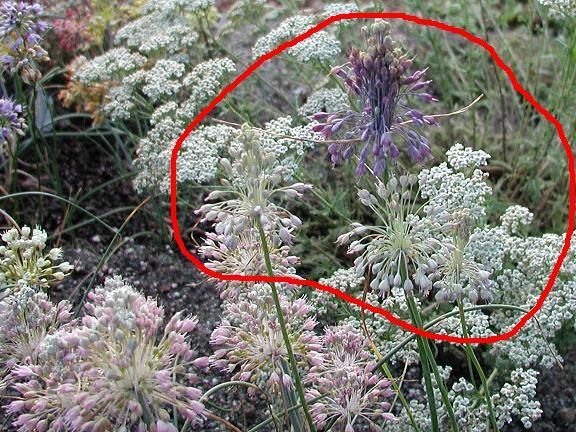 Since the photograph shows such a confusing jumble of flowers, I circled the topic species in red. Behind the blooms are the white flowers of an Achillea and pinkish A. flavum ssp. tauricum in the foreground. Finally there is a drawing of a dark pink form. Photos #1-2 and drawing #3 by Mark McDonough. Photos 4-5 were taken by Nhu Nguyen. 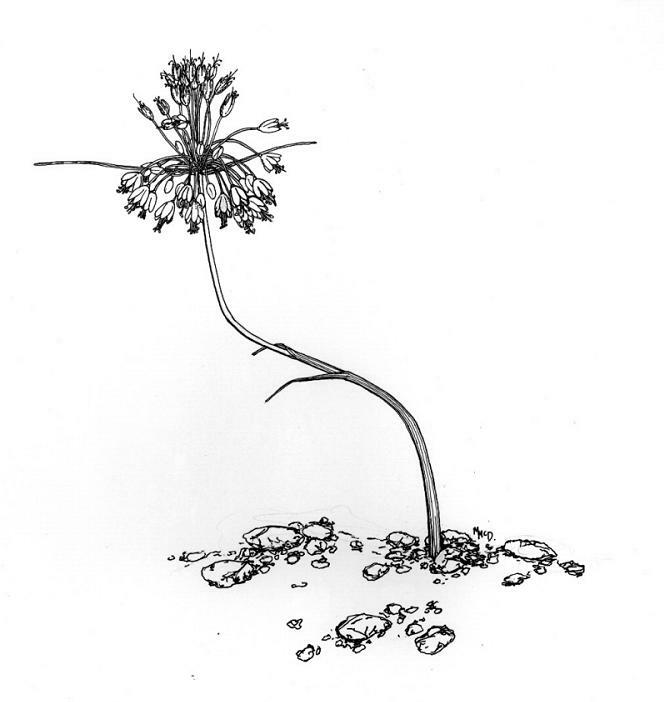 Allium carinatum ssp. pulchellum f. album is a white form often sold by Dutch bulb dealers. Photos below by Travis Owen of an adaptable selection. 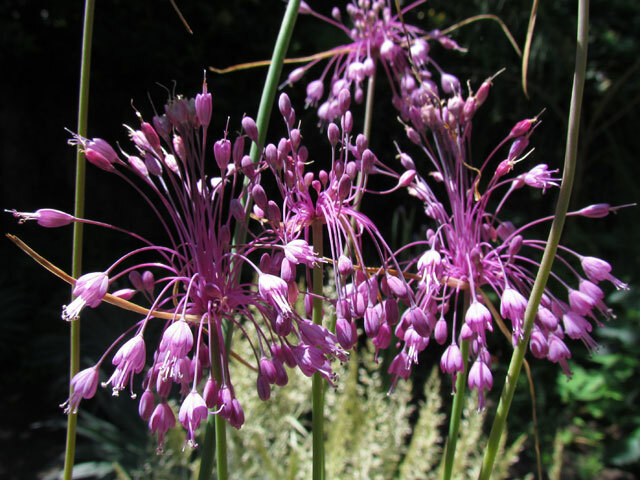 It has thrived in sun and shade, though it flowers better in the sun. The leaves are nearly evergreen in irrigated beds, dying down after new leaves have already broke the soil surface. 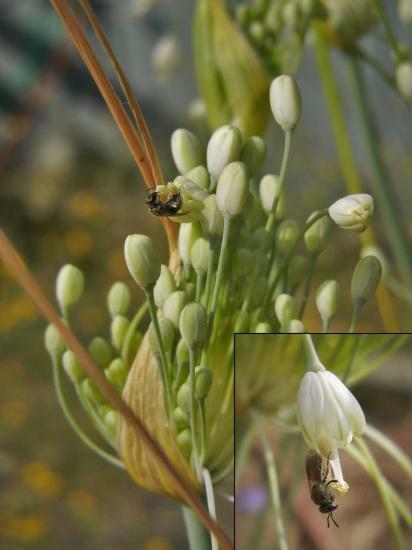 The third photo shows a tiny bee, shorter than a pencil is wide, visiting the florets. 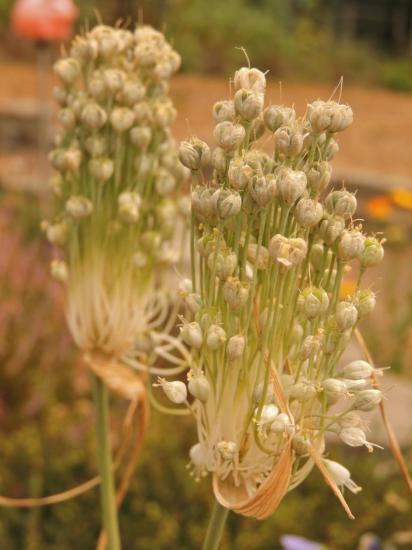 This photo shows the seed pods, like most Alliums the florets turn up for the seeds to ripen.